(Oxnard, CA) Assemblyman Das Williams (D-35th District) is walking a tightrope among his constituents in this sensitive election year after provoking outrage among migrant justice advocates and community groups by signaling his opposition to AB1081 (Ammiano), the CA Trust Act, prior to its upcoming review by the Assembly. Williams also expressed support for Secure Communities (S-Comm), a notorious program by the Department of Homeland Security’s Immigration and Customs Enforcement (DHS-ICE) agency which mandates the cooperation of local law enforcement with ICE. Following pressure by the Oxnard-based Todo Poder al Pueblo Collective (www.TodoPoderAlPueblo.org) and other community members, however, Williams appears to be in damage control mode. Dubbed the “nation’s first ‘anti-Arizona law’” in reference to Arizona’s harsh Senate Bill 1070, the CA Trust Act has been making headway at a rapid pace in the State legislature, gaining the approval of the State Senate by a vote of 21-12 on July 5, 2012. It has been greeted warmly by civil rights organizations such as the ACLU of Southern California, the National Day Labor Organizing Network (NDLON), the CA Immigration Policy Center (CIPC), and the Los Angeles, CA-based Coalition for Humane Immigrant Rights (CHIRLA). “[We] were born at night, but not last night,” Gabriel added. 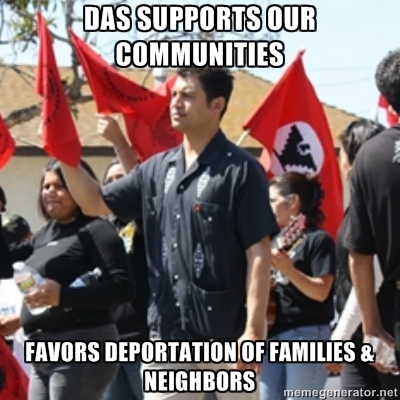 Todo Poder also cited his previous reliance on Latino and undocumented communities during past electoral efforts, and his May 1, 2010 statement that “[Arizona’s SB1070] legalizes that police can stop someone just based on race and an accent.” S-COMM has led to a cascading amount of discretionary arrests and detentions, leading to charges that it is in practice all too similar to Arizona’s SB1070. The Todo Poder al Pueblo Collective has called for a protest to be held in front of Williams’ office at the Oxnard Transportation Center on the corner of East Fourth St. and Oxnard blvd. at 12PM on Saturday, July 28. The action will be held in conjunction with a nationwide call to action for protests against Arizona’s SB1070. There will also be an protest at Das Williams’ office in Santa Barbara at 101 W. Anapamu Street. This entry was posted in Análisis // Analysis, Luchas sociales y solidaridad // Social Struggles & Solidarity, Notas de prensa // Press releases and tagged AB1081, Das Williams. Bookmark the permalink.